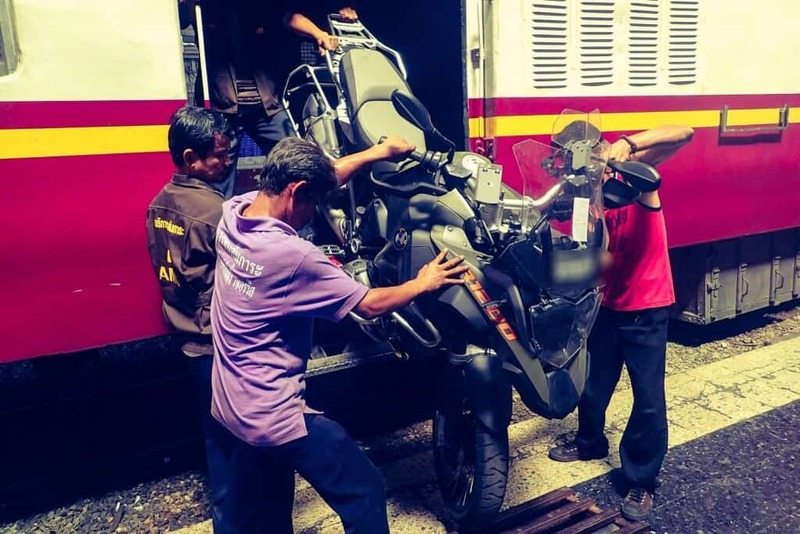 Transporting Motorcycle or a Bicycle on a Thailand Train – Thailand is one of the best countries in Asia that offers exciting motorcycling roads but sometimes the long journey on highways can become a little bit monotonous. 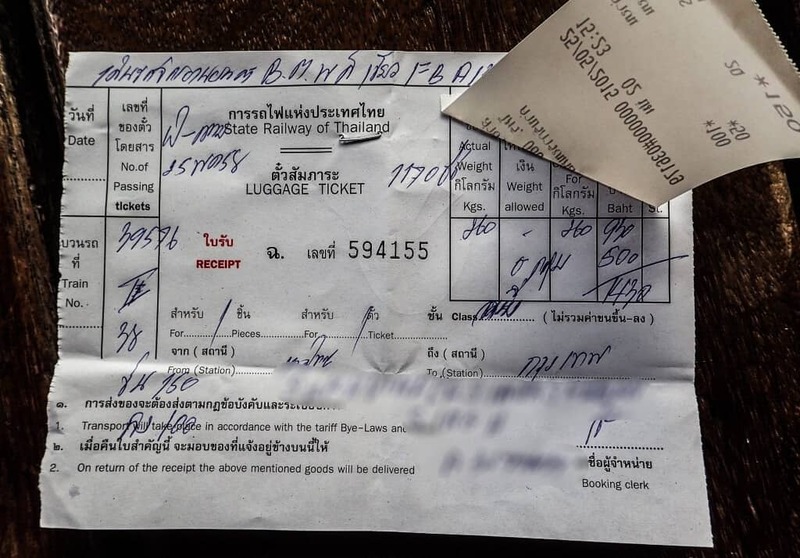 The good news is that you can actually transport your big/small motorcycle or bicycle on a Thailand train to skip riding the long distance journey. No need to spend 12 hours on a highway. Enjoy a sleeper train and arrive the next morning relaxed in the mountains of Chiang Mai or the beautiful coastlines in the South. 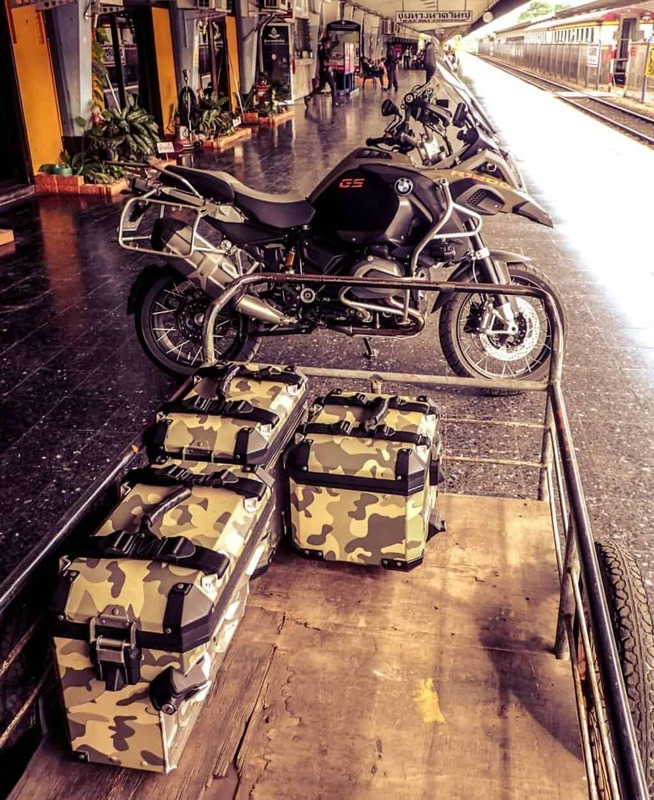 I did quite bit of search on the Internet and I must say the information on how one can transport their motorcycle on trains are lacking or incomplete. I have gone through the process and compiled all the details you need in this article and hopefully it will be beneficial for you. IMPORTANT NOTE: Please note that starting from the 1st of February 2019, you can no longer transport your motorcycle if it’s above 125CC. See the notice as per below and it has been confirmed by the State Railways of Thailand (SRT). No cargo train – Train no: 9 & 10. 1 cargo carriage train no: 13, 14, 108, 111, 201, 202, 212. 2 cargo carriage train no: 51, 52, 109, 102, 107, 112, 115, 116. 3 cargo carriage train – Not available for this route. No cargo train – Train no: 23 & 25. 1 cargo carriage train no: 67, 68, 70, 135, 139, 140, 141, 142, 143, 144, 145. 2 cargo carriage train no: 136 & 146. 3 cargo carriage train no: 133 & 134. No cargo train – Train no: 31 & 32. 1 cargo carriage train no: 83, 84, 85, 86, 177, 178, 255. 2 cargo carriage train no: 37, 38, 167, 168, 169, 170, 171, 172, 173, 174. 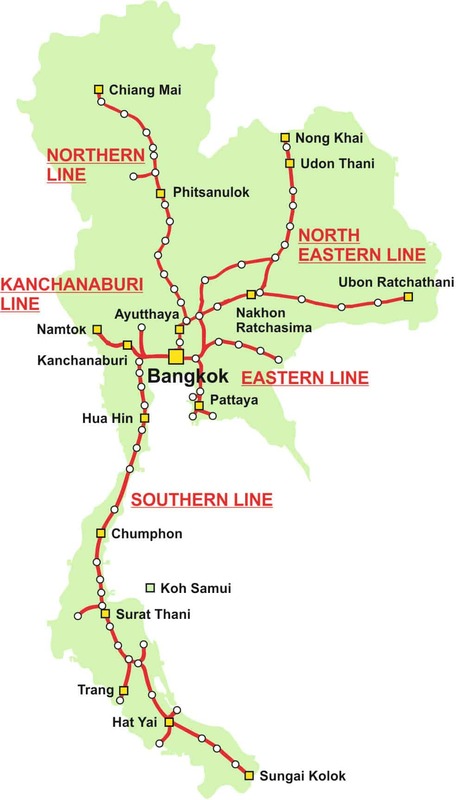 * There is no cargo for Thailand’s Kanchanaburi & Eastern route due to short distance. If you’re in Malaysia, you will need to take it from either Hatyai or Padang Besar (Thai side) as there are no longer direct trains from Malaysia to Thailand. First of all, you MUST book your train ticket for a train that has the cargo capacity to transport your motorcycle. Tell the ticket guy you need to travel with a motorcycle. You may refer to the list above on which train no. has cargo carriages or ask at the ticketing counter. Note: Please ensure you book based on the train no. that can carry cargo. An example of an original Thailand first class train ticket can be found below. 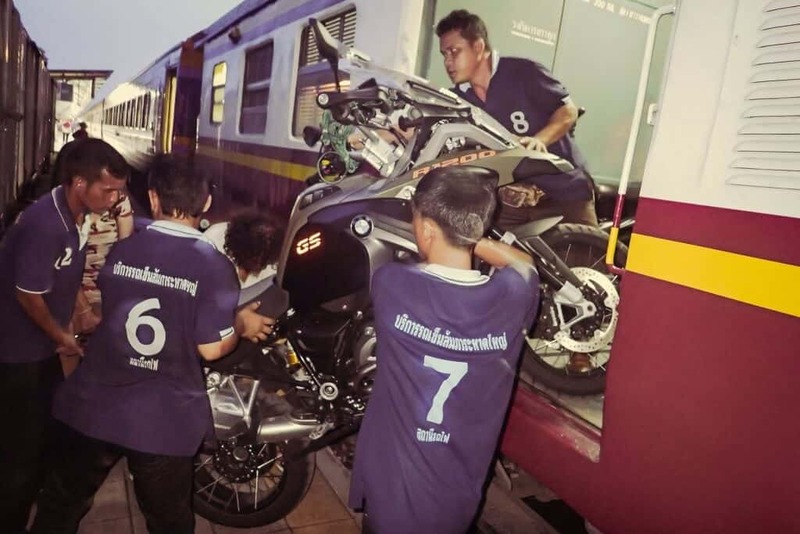 How to transport motorcycle into Thailand’s train cargo? Few hours before the train is scheduled to leave, proceed to the weigh station or the cargo counter (depending on which station you go to) and you will be asked to wheel your motorcycle. Do not start your motorcycle’s engine. At this point they might ask you to pay the handler’s tip. Tell them that you will pay the handler(s) yourself later, usually tip the handler(s) THB50-100 each. DO NOT tip at the weigh station. You might also be asked to purchase tie-down straps for your motorcycle which will cost you about THB 60 or just bring yours. Some bubble wraps will help to avoid scratches on your fuel tank. Note: At some stations, the staff could be trying to overcharge you for your cargo. Since you’ve already know the charges, you can try to negotiate based on the estimated prices. As for documentations, you will need to provide your motorcycle registration document and your passport or Thai ID Card. 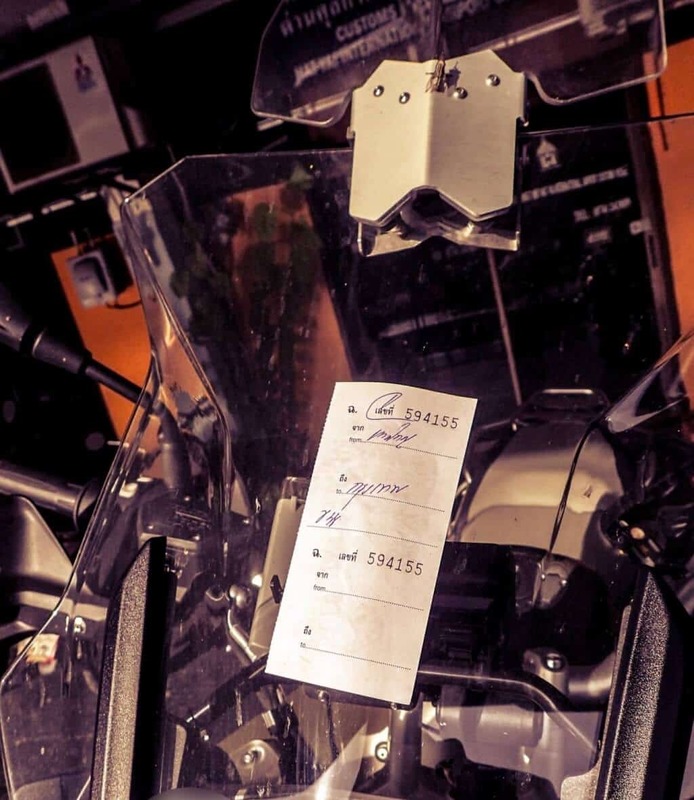 After paperwork is settled, money is paid, you’d be asked to stick a transport slip on the motorbike. You will also be handed a luggage ticket, which you must pass to the staff at your destination in exchange for your bike. Keep it safe! Once the paperwork is done. You can just wait for the train or go for coffee etc but do keep an eye on your luggage / boxes. When the train arrived, the cargo men will take your bike to the cargo carriage for loading. Follow them. Handler’s tips (THB50-100 each person) are expected here and they might get sulky if it is not forthcoming. Please note they will not allow you to put your luggage or boxes into the cargo but you can carry them with you and put it at the passenger’s luggage compartment. Once the bike is loaded and secured identify who on the train is in charge of the cargo carriage and if you want to ensure your bike is looked after, tip him too. You may need to check how they have tied the bike. Sometimes, they may ruin your front brake by tying it back too tightly. 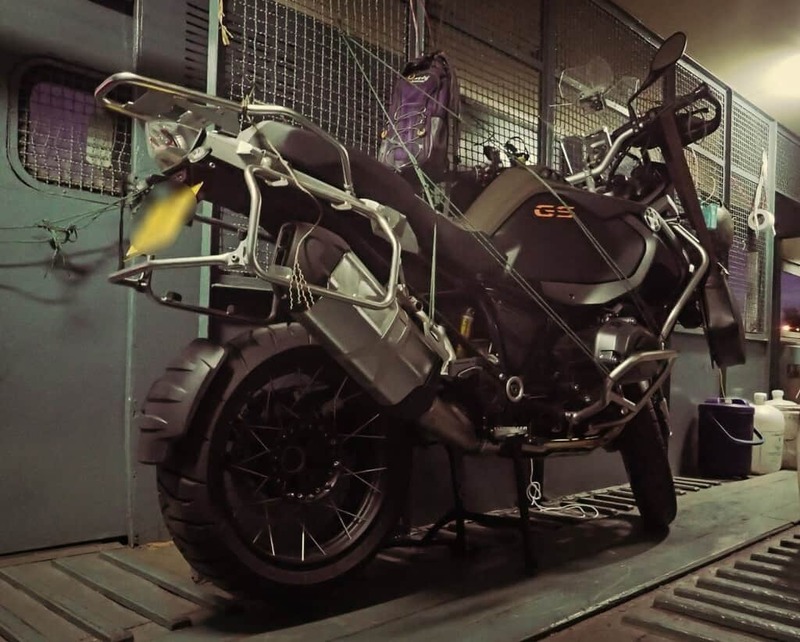 It is recommended to be present at the loading and to supervise the securing of the bike. The handlers will be happy if you offer to give them a hand and in the same time you can make sure that everything goes smoothly. Once you’re happy with your motorcycle in the cargo compartment, just take your seat in the train and enjoy the ride. Once you’ve arrived at your destination and under normal circumstances, you will find your bike unloaded by the time you are off the train. Check your bike for scratches, tip the handlers again (it is totally up to you, since everything has been paid already), pass them your luggage ticket and then wheel the bike out of the station. 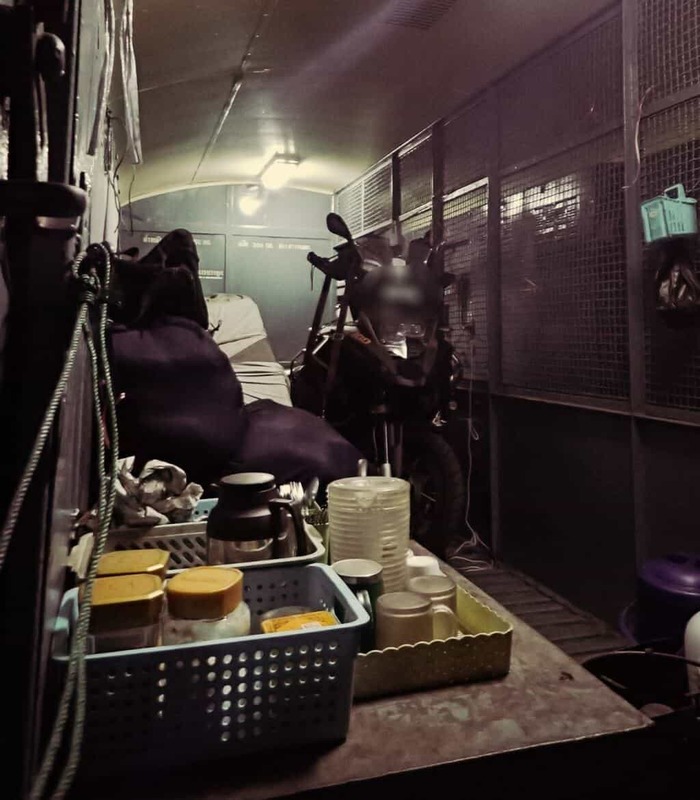 If your motorcycle is on another train/cargo, go to the cargo area of the station and get the phone number of the person who deals with cargo arrival. You can then give them your number (if you speak Thai) to notify you when your motorcycle has arrived. 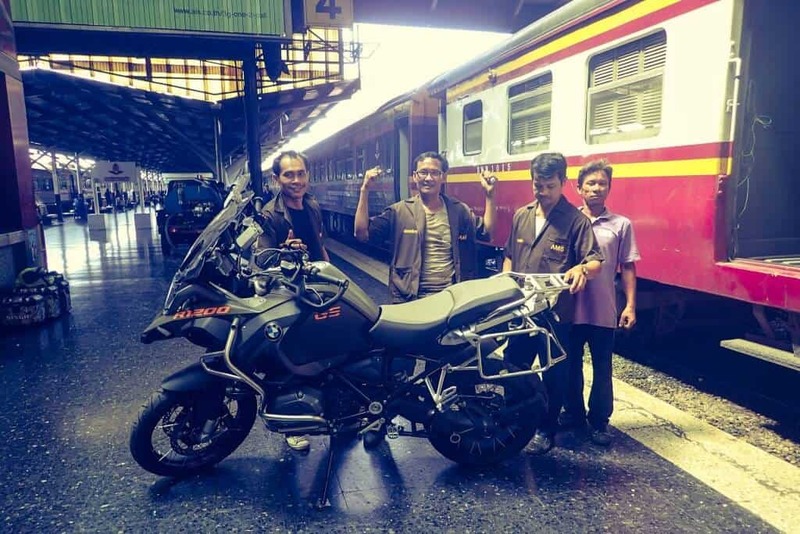 In most cases, your motorcycle will be on the same train and once they have unloaded it, provide them the slip and your motorcycle is ready for collection. *The biggest problem you may encounter is when loading the bike at stations that are not the final stations of the route, such as Chumphon or Nakhon Sawan. There is sometimes friction between the train staff and the station staff, especially on night trains. The motorcycle might get refused or they simply can not load it in the short time the train stops there. This is a fraught experience. The procedure is that they will then put it on a later train. If you find this is the case go to see the main guard for your train, show him your paperwork and find out what has happened and when the bike will arrive. He can call the station and find out when it will be sent. *Info credited to Dan White. 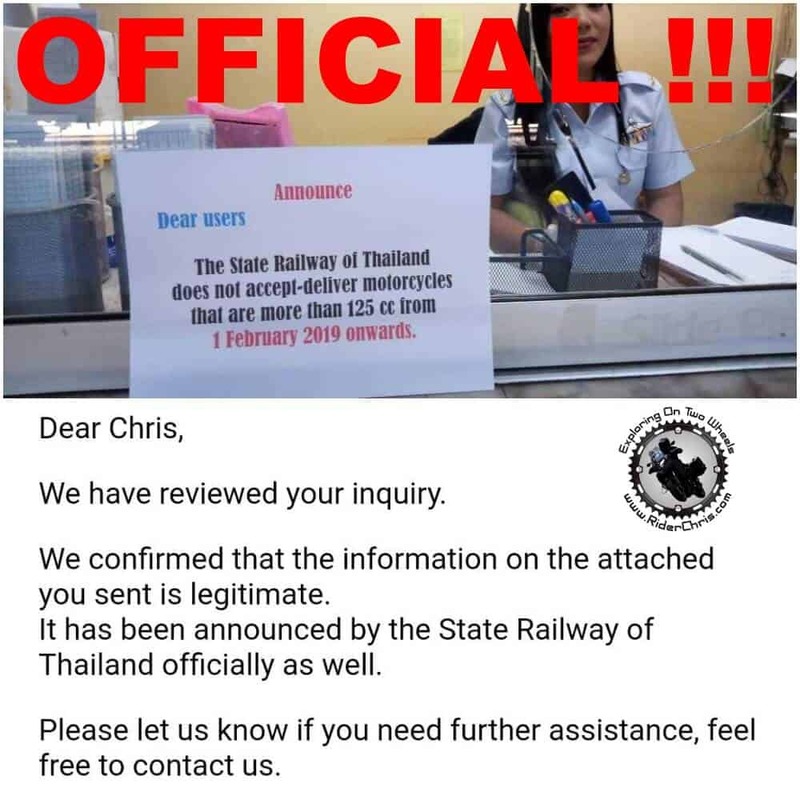 Some information may change from time to time by State Railway of Thailand (SRT) and if you need confirmation, you may contact SRT over the phone as per below or refer to Thailand SRT Train Contact Information.